Fantasy Football 101 with Papa Wheelie: What the Hell is a Snake Draft? 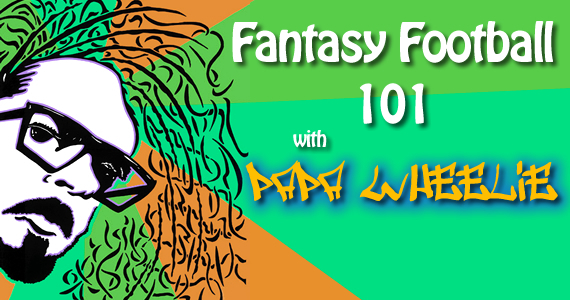 Papa Wheelie is new to fantasy football, and he’d like to share his experiences with you. As I ask Lord Jobu just what exactly a “snake draft” is, I’m woefully reminded that I don’t have a freaking clue what I’m doing here. Sure, like any god-fearing, red-blooded American, I do know a few things about sports, and I sure as hell know a lot about racing. 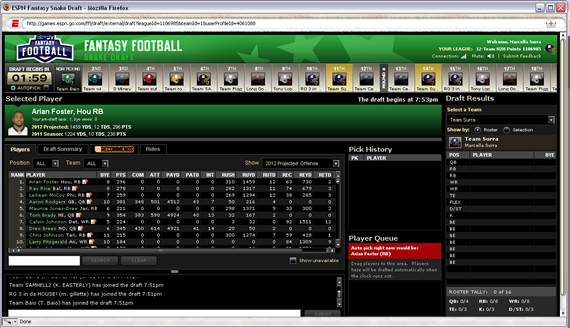 However, I’ve never embarked on something quite like Fantasy Football. Even the name reminds me of something like old-shool Dungeons and Dragons, where you really have to know something about the game to really get into it. And that’s just it; There’s only so much I know about American Football. My best friend said that playing Fantasy Football really helps you follow the game a bit a more, and it seems like everyone and their sister seems to be playing. I figure, what’s the harm in joining a little office pool? So, for whatever it’s worth, I’m embarking on the endeavor to write about my complete noob’s experience in my first season of playing Fantasy Football, and all the ups and downs that comes with it. So let’s get right down to the meat and potatoes of this: The first part of the game… the draft. Before anyone can start playing, you first need a team. To get that team, you need to hold a draft. The order is pretty much randomized by the computer, and the earlier you go, the better players you can pick. At this point, the interface for the draft looks pretty much like something that would control a space shuttle, so I’m very tempted to just let the auto draft thing do its business. I’m cued by the ESPN football music that the draft is about to begin, so here we go. Right off the bat, a good team definitely needs a good leader, so I’m going Aaron Rodgers. Of course who knows how he’s doing, but he’s projected to do well. Beyond that, I’m going with names and stats. I haven’t watched a lot of pre-season stuff, so I don’t know how most of the players are doing. At this point, Im starting to go off my gut feeling, because there’s no way in hell I’m going to know if Vincent Jackson is going to fair better than Marques Colston. But I know I should even out the team a bit, and get the best bang for the buck. So, in the interest of time (and a 5 month old daughter at home), I’ll pick some key players to round out the mix, and then it’s all auto pilot from there on out. That should make things interesting. I pick my main players and let the computer auto draft my benchwarmers. The computer didn’t do so bad. It did get me player who was suspended for drug use, and a couple of injured players, but hey things get better right? Since our draft was only the day before the kick-off game between the best team in the universe (The Broncos) and the defending Super Bowl champion Baltimore Ravens, there’s not much time to lock in and get the teams ready for week one. This is where I start to notice some already apparent holes in my team. Right off the bat, I’m a 12 point underdog for my first match-up. Not too promising on paper, but after a few moves I manage to cut that spread to a theoretical two point game. That feels like a much more manageable game, so I guess we’ll see how week one wraps up pretty quickly. Miguel Antonio Palomar liked this on Facebook.